Picking cabinets is a process. Here you’ll find the product information, handy tools and quick tips necessary to spark smart thinking and organize your thoughts. With Diamond, you can go from Point A to Point “Be Done” with confidence. Our three brand new cabinet doors add even more interesting options and potential combinations to our already impressive lineup of transitional and modern selections. Whether you're looking for a style that's pure and simple, something that leans a bit more traditional, or, perhaps, one that adds a rustic vibe, we offer just the right door to meet your needs. The only thing that could make our newest flat panel door,Wells, any more attractive is knowing that it has a raised panel counterpart. Whether you decide to use it alone or pair it with its partner for an interesting contrast, the 3" wide rails, standard five piece drawer front, and clean, subtle details of Wells look great in any finish, in every home. Available in Cherry and Maple, and with a slab drawer front option. Davis is a striking equivalent to new flat panel, Wells, but with a solid, raised center panel that provides a bit more detail with a slight nod toward more traditional styling. Classic and beautiful on its own, and more dramatic when paired with its partner, Davis also features 3" wide rails and a standard five piece drawer front with a slab drawer front option. Available in Cherry and Maple. Introducing Worthen, a versatile, wide rail door available exclusively with Elk finish, a medium walnut brown, textured wood grain in PureStyle™. 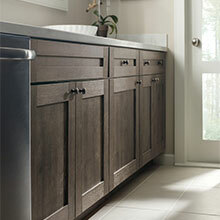 Worthen offers a modern take on a rustic look, keeping it warm, not stodgy. If you're one to think outside the box, this style can also act as a unique design complement to a bright, modern room. Bring the beauty of the outside in, with bright beach colors or the warmth of the wilderness. 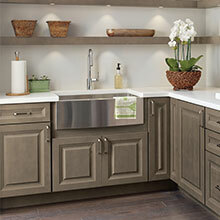 Our new cabinet colors, inspired both by nature and the latest trends in home fashion, mix and match effortlessly with each other, as well as with many choices in our existing finish palette – allowing you to be just as adventurous as you care to be. 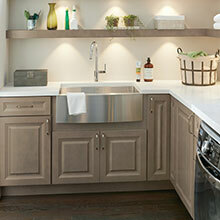 Introducing Egret, a glowing addition to Diamond's white family of cabinet finishes. It shines as a neutral and complements just about every finish in the palette, including other whites. It works wonders as an accent, but does beautifully as an all-over color as well. 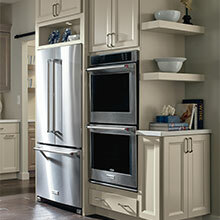 Egret adds a new level of sophistication for those who lean toward the classic beauty of white cabinetry. Available on Maple and with Amaretto Crème, Grey Stone or Toasted Almond glaze. 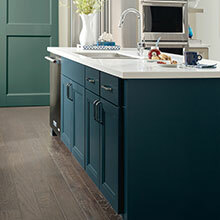 Deep blue becomes an exciting neutral when used with lighter, complementary colors. 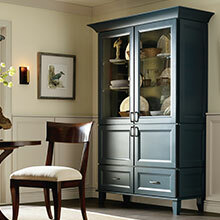 New Maritime is a dark, navy tone that works perfectly as an accent color, or to give a room a stylish focal point. It adds the perfect touch to a fresh and casual look, and is neutral enough to mix across multiple palettes. Available on Maple and with Amaretto Crème, Grey Stone or Toasted Almond glaze. 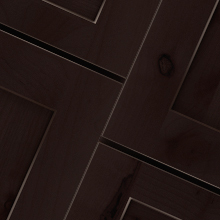 Seal, our new versatile, semi-translucent brownish gray stain, is available on all Diamond wood types: Alder, Cherry,Hickory, Maple, Oak and Rustic Alder. 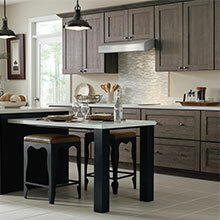 This soft neutral presents a sophisticated, high-end look when used on its own. It also blends well with other brown-toned stains and many opaques, as well as pairing nicely with bold, complementary accent colors. Seal excels at enhancing the natural beauty of wood and gives any room a rich warmth. Elk is a medium walnut brown finish offered on textured PureStyle Laminate for a dimensional wood look that captures an element of the outdoors to create a weathered, transitional feel that is suitable for a variety of settings, from rustic to modern. No need to feel cheated if you want to see more of Thatch. Our newest finish expansion offers just that – popular Thatch, a dark, walnut colored stain, is now available on Alder andRustic Alder wood types. Perfect for a rustic look that be used throughout a room or as a unique design element. Express your style confidence with Diamond.